From the Art Deco fashions to the flapper dresses women still love 1920s clothing drips with sensuality and quality. 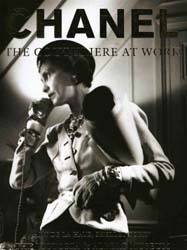 Though the 1920s is known best for the shortened hemlines and straight angles of Coco Chanel's styles. There are many other designers who made their marks on the era with longer, freer-flowing "picture dresses" like those of Paul Poiret. Jeanne Lanvin was another who helped develop this form, her work was features in a 1926 issue of Vogue Magazine. Lanvin was an ambassador for the femininity of woman's clothes, marking a sharp contrast to the sharp lines of the popular dresses of the day. She zigged where most other designers zagged. Lanvin was the mother of the robe de style which harkened back to the flowing dresses and petticoats of the 18th Century. 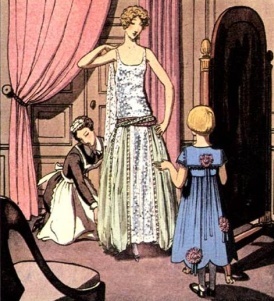 1920s clothing was defined by straight flat angles. Stark in their sheer simplicity. These "shapeless" dresses hid a woman's natural waist and put an emphasis on her hips. Sashes, swatches, swaths of fabric, hip length coats marked a woman's hips as the point of emphasis in these styles. In this time period designers also began experimenting with prints and geometric designs meant to reflect the shape of the dresses they were feature on. Taking their styles from the Japanese kimonos these "blank" canvases lent themselves to beautiful Art Deco dresses that distinguish much of 1920s clothing. Sports and sporting events became a hugely popular staple of 1920s fashion. As women became more integrated into the "modern" world, the began attending and competing in sporting events across the country. shapes that mark the beginning of the decade were too easily "knocked" off by lower quality garment companies and retailers who pandered to shoppers looking for the same designs, at a discount. Because of this sportswear became an intricate web of panels, flounces, flared sleeves, and complicated designs. Fine quality fabrics distinguish the better fashion lines. Mohair, rayon, wool blends, gabardine all became standard in the finer quality dress of the day. With Prohibition in full-swing in the 1920s, the "nightlife" culture became a great escape for the urban American. Dressing in fine gowns and beautiful functional flapper dresses became standard for a night on the town. Mink shawls, ermine coats, beautiful intricate "slave" bracelets and strings of pearls adorned these beautiful outfits and became standard dress for the discerning modern woman. This whole design movement happening at such an important period in modern history created a perfect storm of fashion and function. 1920s clothing ushered in a new age of fashion.